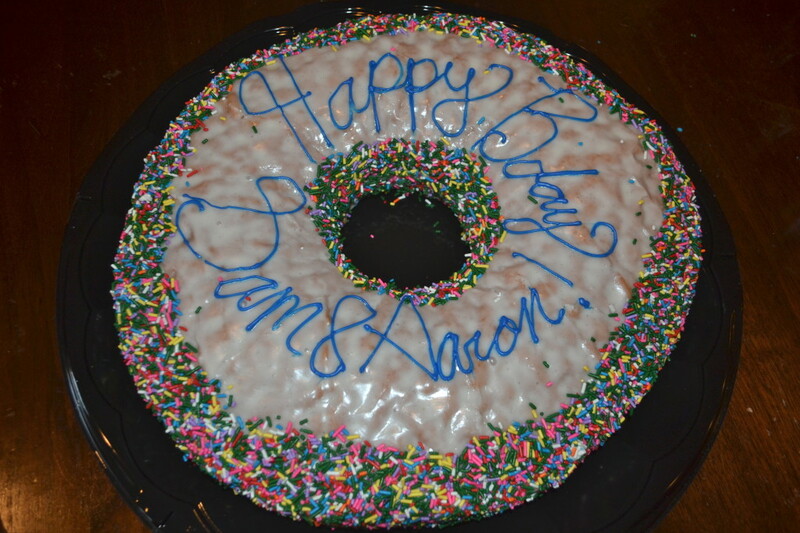 Sam and Aaron turned three today. It’s been another big year, as all the toddler years are. I’ve so enjoyed our mornings alone together. Not that there isn’t something special about having the whole family together, but just having the twins in the morning gives me some time to spend with them individuallyish. Having twins is great because you never need to book playdates. They constantly have someone here ready to play. So most mornings we don’t plan at all. We just pack water and lunch, walk out the door and see where it leads us. And because we don’t do many playdates, they mostly just play with their brothers. They don’t go to class or school so a party seemed unnecessary. 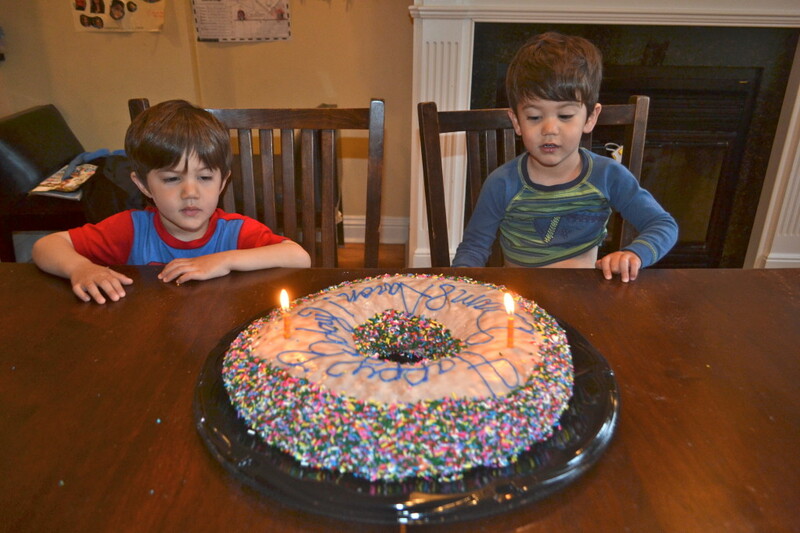 This year the twins started to be able to play with the older boys and each other in earnest. Lots of executive function. It’s adorable to see how each child has formed it’s own special and different relationship with each other. Aaron continues to be the daredevil. He is also the most easy going – of all of the kids, not just the twins. This is not to say he never cries, but he handles disappointment and change with ease. Also, he’s very sweet. When Sam is crying for something, Aaron runs and fetches it. And he does it all while brandishing a stick (when outside) or a chopstick (inside). Sam is more cautious, more demanding, more articulate. He is more social, often seeking Aaron out and also more open to the games the older boys suggest. He likes to have things a certain way and will blow a gasket if he doesn’t get his way, even if he forgot to tell you how he wanted it in the first place. But man, is he clever. He just gets it. He throws balls instinctively and picks up toys and plays with them just how the inventor intended. And for the past month he’s done it all in his “Hulk Smash” costume. And when you see him in it, please remember to call him Hulk Smash if you expect to get a response. 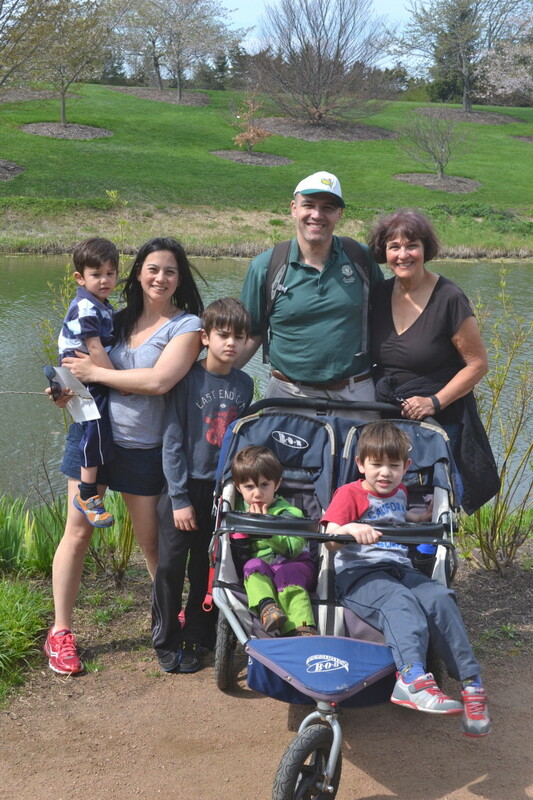 Next we planned a morning out at Chicago Botanical Gardens. 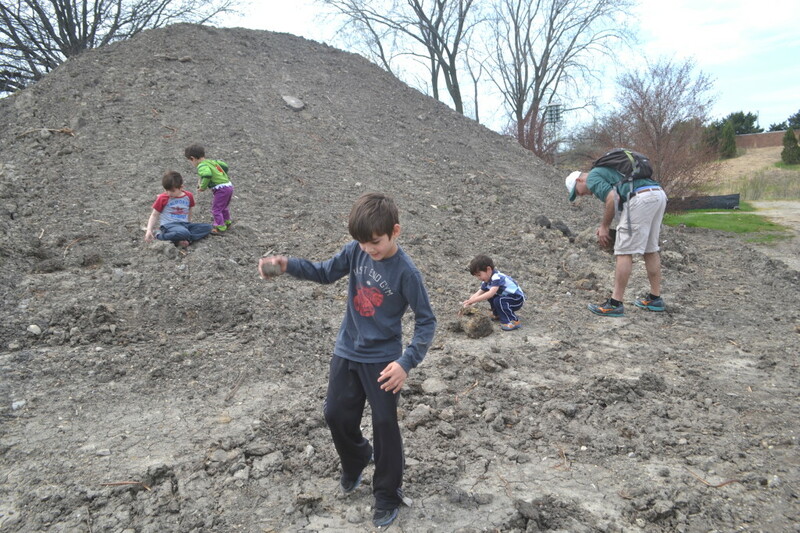 We wanted to check out a new section of the garden and on the way we found these huge piles of dirt. HUGE PILES OF DIRT! That’s just awesome. That’s more amazing than all the gorgeous flowers and landscaping! Hours of entertainment people. Hours. Next Adam took us all out for some lunch and then it was time for the twins to pick out their toys from the toy store. 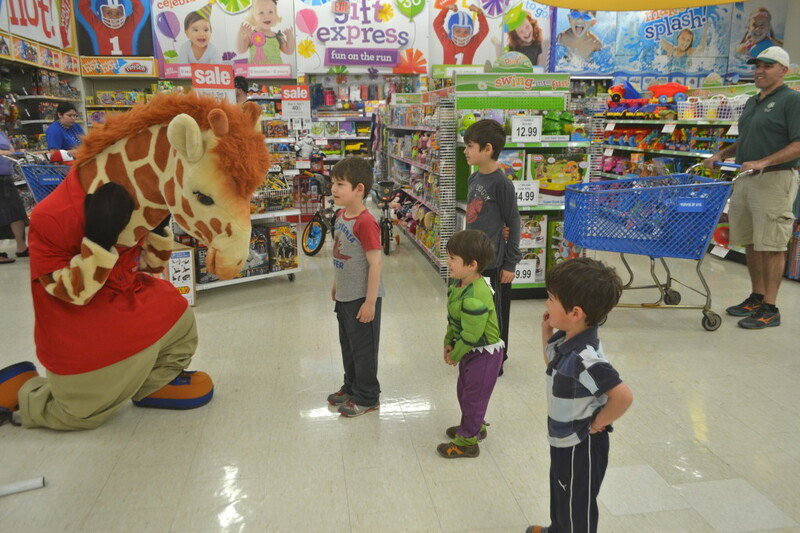 I’ve never seen this before but Geoffrey the Giraffe was there. These sort of live mascots or characters always freaked me out as a kid. I remember as a little girl running scared at Chuck y Cheese every time I went, but Ben loves them. We could barely tear the kids away. Hello! We are in a TOY STORE kids! 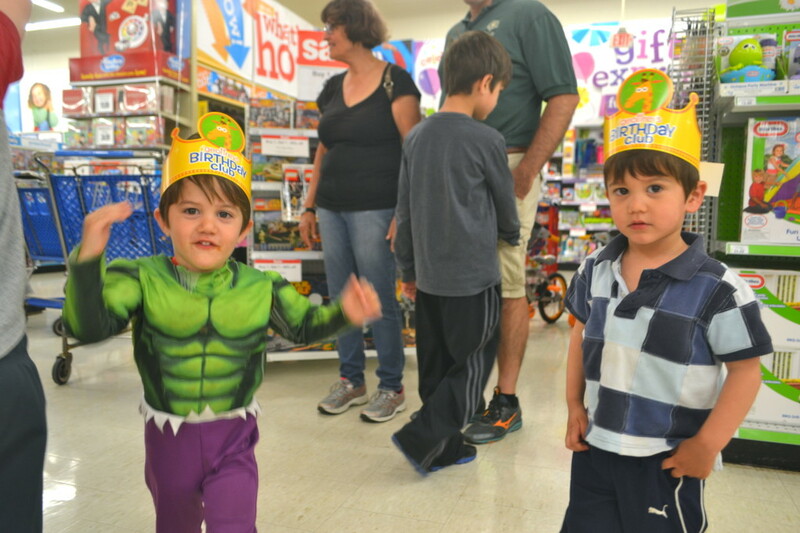 When the manager found out it was the twins birthday they gave them crowns and balloons. It was a really cool thing to do. 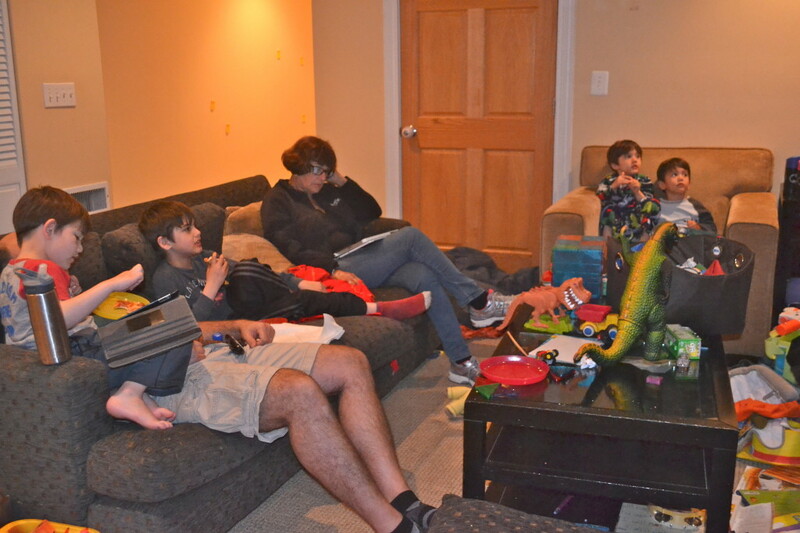 Afterwards everyone was tired and so we let them eat dinner in front of the TV for a special treat. I meant to make the twins a great train cake from a mold I borrowed from my friend Carrie, but last night Adam and I went to our friend’s son’s bar mitzvah and shamelessly took TWO take home boxes from the dessert buffet. 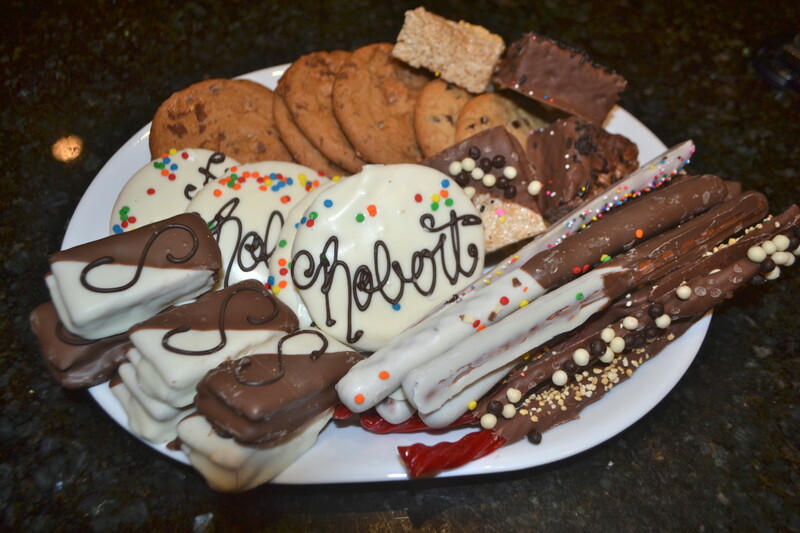 Mazel Tov Robert and thanks for the treats!